It's weird that they'd leave this screen in here, because it's there in every single game that has this variant of the catalog. It's a waste of space, given that the demos are supposed to be free and it only costs them more to add in more space. Just something weird I felt like sharing. It's like that in the Humongous Classics Collection too. Also, I've never seen the catalog look that way before. In every copy I've seen with this version, it also has Pajama Sam 1. Did you get it off the original release of that game, by any chance? Was this unused screen from the May-June 1997 catalog (which was really released in March-April 1997), because I can see Pajama Sam on the bottom of the screen, while I can also see Fatty Bear's Birthday Surprise on the same screen? How ironic! Did work on Pajama Sam 1 begin in 1994\1995 by any chance? I think those screens are the prototype versions of them. Pizzaking27 wrote: Was this unused screen from the May-June 1997 catalog (which was really released in March-April 1997), because I can see Pajama Sam on the bottom of the screen, while I can also see Fatty Bear's Birthday Surprise on the same screen? How ironic! Did work on Pajama Sam 1 begin in 1994\1995 by any chance? I think it was. As for the development of Pajama Sam 1, I think it started in late 1995 since it was released in 1996. I've seen that before while sneaking at Spy Fox 1 folder. 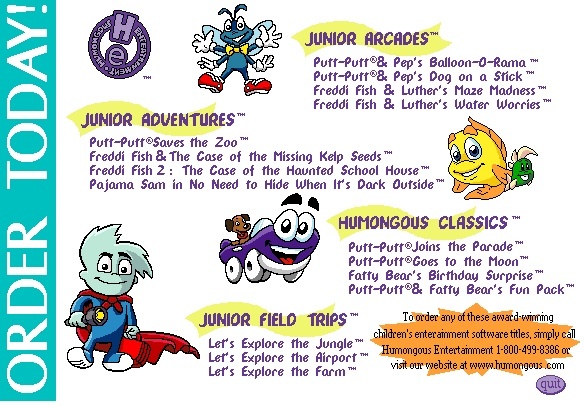 I recall seeing this on my copy of Putt-Putt Saves The Zoo while going through the files to find the demos.